George Siemens says, "I've thought in networks since my earliest memories and moments of self-awareness. I recall being six or seven years old and trying to grasp the concept of eternity - a perpetually future-forward cascade without end. It was incredibly stress inducing, but served as early seeds for understanding the world, both in physical and conceptual form, as being about connections. " 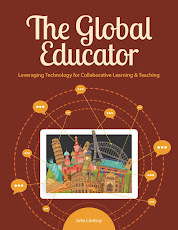 "Since the 1990’s educators have leveraged the power of the Internet to forge online global collaborative learning. More recently global competency and intercultural understanding in conjunction with cross-border collaboration and digital fluency have emerged as ‘future ready’ key capabilities. 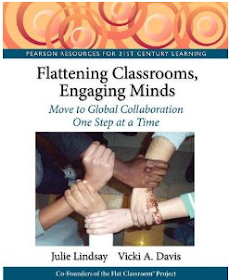 However, learning environments struggle to embed authentic real world learning and build capacity for global connection and collaboration. 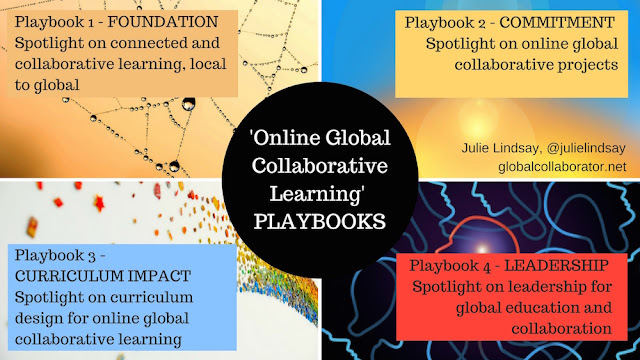 Julie shares new perspectives on developing a Global Collaborator Mindset and implementing Online Global Collaborative Learning (OGCL) as a pedagogical approach. " With my Open Pathways Design Leader and Online Facilitator hat on I want to share information about the online course I co-designed and created in 2018. This has been prepared for Open Education Week 2019. I encourage readers to browse the Resources collected on the Open Education website this week (and beyond) - you will find DOL shared HERE. DOL is short for the free, online course, ‘Get ready, get set, become a digital online learner’. It was created by the uImagine Open Pathways team at Charles Sturt University and launched in August 2018. Here at uImagine we have affectionately called this course DOL since inception...and it is a DOL! A baby DOL, still in its infancy and getting stronger each week. 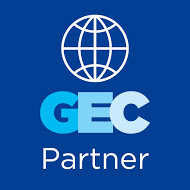 Consisting of four modules it focuses on developing skills and positive habits for learning online using a variety of digital tools and online platforms. Many people want to learn online however, they often lack the skills and confidence to do so. This course is part of the move to open and free learning through easily accessible online resources. It was designed to provide a pathway into getting started with online learning, setting up a digital profile, and choosing and using digital tools for productivity connection and collaboration. What is the approach to learning for the course? Like other quality online courses developed using the Open Learning platform this course uses a constructivist approach to learning and fosters interaction between community members (students). Learning activities are designed to support sharing, commenting and co-commenting. Participants are encouraged to not work in isolation, and to be active online learners as part of the collective. What do students do in the course? As soon as students arrive in the course they are invited to complete a fun activity that immediately supports digital skill development and cognitive function. 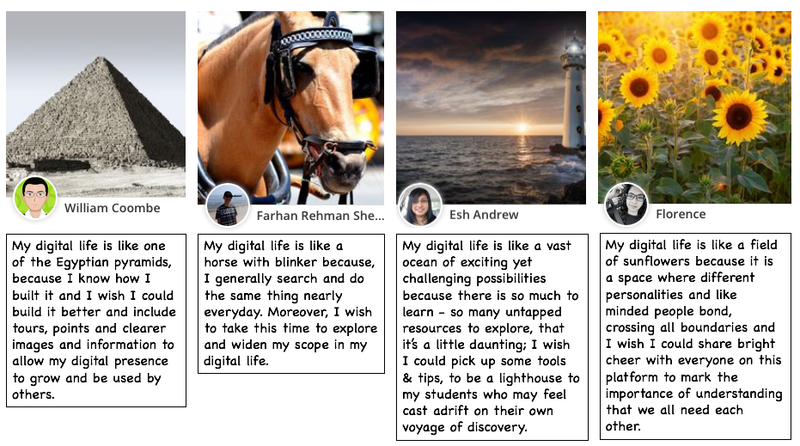 They are asked to complete this sentence and find a copyright free image to support it, “My digital life is like ….., because …. and I wish I could…….to…….” Here are some examples…. The course then provides a sequential set of modules (although users can jump around and follow their interest) that include a range of different interactive and individual activities around the course concepts and themes. Underlying student achievement is the expectation participants will complete the ‘Online learning Scrapbook Challenge’. This encourages the setup of a ‘blog’ using a choice of platforms and throughout the course there are a series of ‘challenges’ for students to record their thoughts and achievements on their blog/scrapbook. For many this is the first time they have set up their online profile and considered creating and writing a blog. Scrapbooks are shared via the embedded Padlet - and readers of this blog post can peek into this shared activity here. Who is doing this course? Why should I do it? DOL has participants from around 40 countries, and the intercultural interaction adds interest to the learning. Those who join are of all ages and professions but have a mutual goal - to improve their ability to work and learn online. If you are wanting to learn more about how to build your online learning capacity, your digital literacy and fluency, and your digital agility then this is the best course for you. You might be just out of high school (or still in high school! ), or you may be in a professional position (we have a number of university lecturers who have joined the course! ), or you may be at home looking for that next boost of confidence to apply for another job - this course caters for many different aspirations. In addition, the course is fully facilitated by Julie Lindsay (that’s me!) 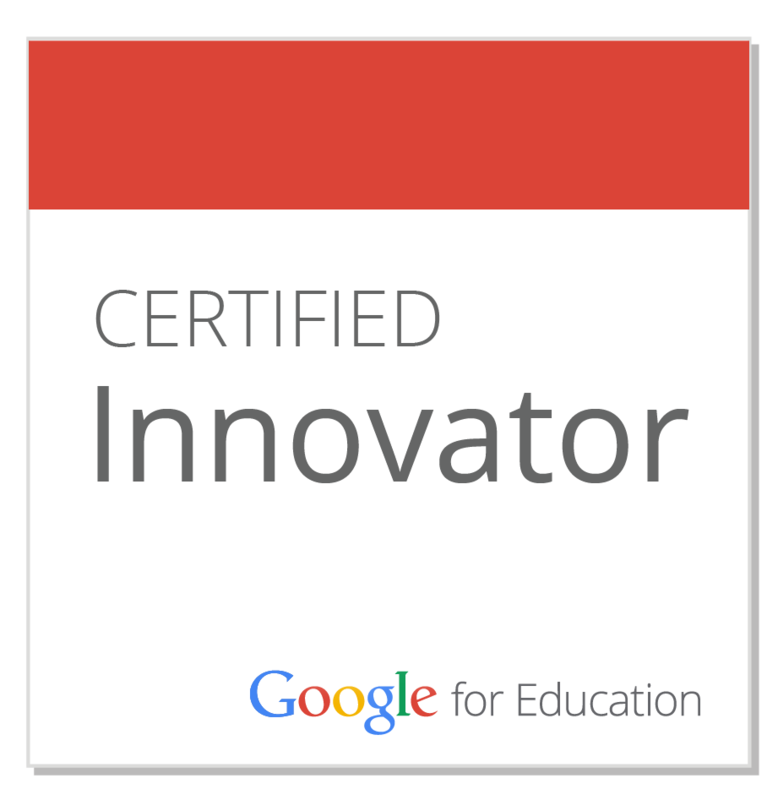 who is an online learning designer, innovator and facilitator with years of experience at K-12 and higher education levels. This is not a course where you are by yourself trying to work things out - we learn as a community and share the challenges. Finally, this course never closes, and you can take as long as you need to complete all modules and activities to receive your certificate. You are invited to find out more via the DOL landing page. Watch the video, read the blurb and decide if this is what you need. I will be waiting to welcome you! Great advice! Read the piece about microcredentialing - start learning online in small bites/bytes today! Also - many of the course on the openlearning.com portal are free - open and ready for you to start! With so many free courses available, time & money are no longer excuses. This year, it's time to join an online course! he Higher Education Learning Framework (HELF) is an evidence-informed model for university learning. The HELF is based on the seven main themes emerging from a rigorous study into higher education learning undertaken by researchers in the Science of Learning Research Centre. An overview of the HELF is provided in the HELF matrix. Each of the 7 principles is further described in the HELF handbook which provides (i) an explanation (ii) implications for teachers, students and assessment and (iii) a discussion of current literature relating to the principles. Patter talks about conceptual and theoretical frameworks for PhDs. A theory is just a way of explaining, of saying how things relate to each other, why they are the way that they are, and how they relate to other things.